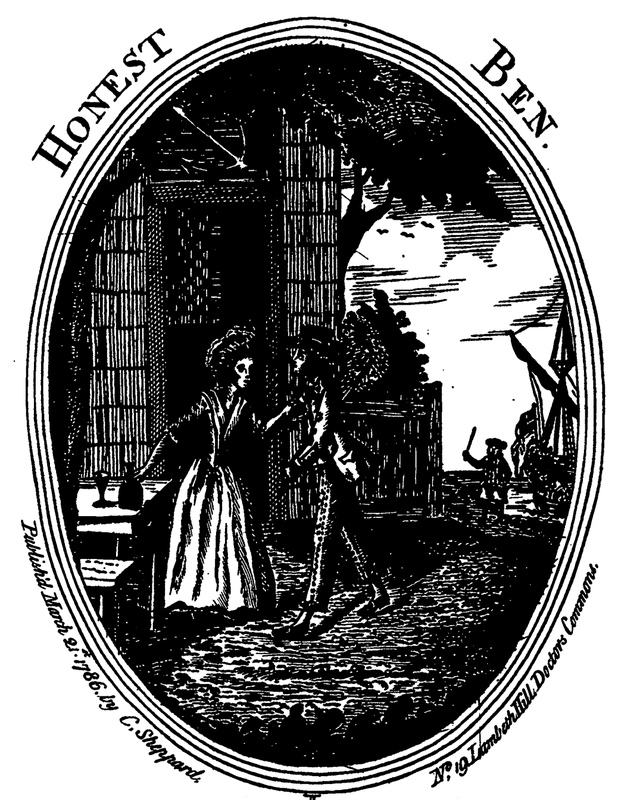 Honest Ben, printed by C. Sheppard, 1786, Bodleian Library Broadside Collection. Today's entry in the sailor's farewell trope is a broadside ballad sang from the throat of a sailor heading gout to see. Ben shares a "parting glass" with his love Sue, while the boatswain calls for him to repair to the ship. This is one of the very few images I have found explicitly depicting a boatswain. I can confidently say that this is the bosun depicted here, because unlike many engraves of broadside ballads, C. Sheppard appears to have custom illustrated his rather than reusing the same engravings for multiple songs. Unfortunately, the publicly available digital scan of "Honest Ben" is not high resolution. The boatswain waves his rattan toward Ben, beckoning him to the waiting warship. It is difficult to make out much beyond that. It appears that he's wearing petticoat breeches and jacket, but I'm not even positive about the boatswain's hat. I am slightly more confident about Ben's clothing. He wears a round hat with a conical crown bound in a lighter colored band. His jacket ends at the top of the thigh, features flap pockets, and closed mariner's cuffs. Under his arm is tucked his trusty stick. Ben's trousers end well above the ankle, but I am not sure if they are striped or plain. He also wears white stockings and pointed toe shoes.